What if I’m not musical, have never played an instrument, or was told I couldn’t be in band? Bottom line: if this music moves you, most likely you will be able to learn to play it at Kutsinhira. In many parts of Africa everyone participates in making music. Everyone sings, claps, dances or plays an instrument. Although some people have a shavi (a gift or a talent from an ancestor), there is not generally a distinction between people who are capable of making music and those who are not. Prior musical training, particularly in piano and other forms of percussion, can be an asset by training the ear to listen and familiarizing a student with learning various rhythms. However, in some ways, musical training may be distracting. People trained in Western music (classical or jazz, for instance) may want to fit African music into the system they know. Although there are some similarities, it takes years of steeping ourselves in the music before we get a good sense of this particular style. Do I need to have my own marimba? Will I need to get a marimba to practice on? Instruments are provided at the center for classes, but you’ll probably want to have one to practice on at home. In the early days of the center, very few people had instruments of their own. Now, many people build their own or purchase one through a local builder. It is also easy to arrange to rent a marimba via the center. The important thing is to find a way to really take in the rhythms and melodies and make them “your own.” This can be done by tape recording the few parts introduced in a class and playing them while you are doing dishes or walking the dog. If you can sing the line, you have it. All you have to do then is find the keys on the marimba. A keyboard may also serve to let you plunk out a line you have just learned. How is the music taught? Dumi often told his students “Don’t think, listen!” We learn by ear. We use no written music. The music is polyphonic, consisting of many lines. The lines usually have four phrases that repeat. Students typically learn two or three lines during a class along with some history of the music and techniques for playing the marimba well. 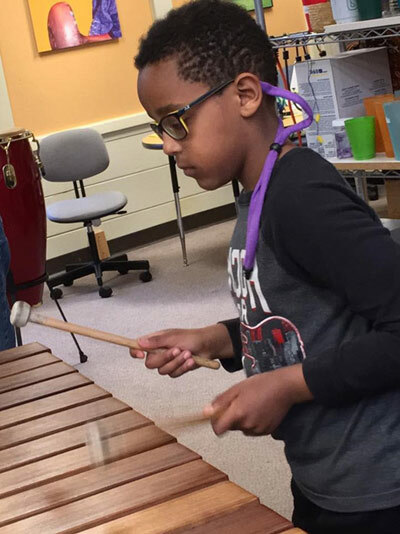 Recently I heard someone describe Zimbabwean music played on marimba as “very accessible.” I really agreed with that, because I’ve seen students who have studied only a few months play a simple part with seven other people and have great satisfaction. The first couple of years of study at Kutsinhira usually involve a repertoire of songs that are relatively straightforward. Most of them are Dumi’s compositions that he shared with his Northwest students. Students may learn all or just a part of the song depending on their capabilities and time to practice. From there the music takes some interesting turns and becomes quite intricate and exciting; for example, the repertoire includes mbira pieces arranged for marimba. I believe that all of us at the Center, including the teachers, see ourselves as perpetual students of this music. How old do kids have to be to start? I’ve seen children as young as three years old show incredible ability to learn and play the lines. However, the ability to function within a group and learn together seems to take more maturity. Some 7-year-olds have that maturity and most 10-year-olds have no problem learning in this format. Typically, younger students begin learning marimba in private or small group lessons with a Kutsinhira teacher. These students then progress into group classes when ready. I have found that children who hear the music and tell their parents they would like to learn to play marimba tend to be most successful (in contrast to families in which it’s the parents’ idea that the child learn the music). This is probably true for all musical instruments! Most of our youth players also play a “western” instrument (e.g., strings, piano, band instrument). Zimbabwean music provides a wonderful complement to these studies because everything is learned by ear, the rhythms and interlocking parts are enthralling and (at least for the beginning marimba repertoire) fine motor control is not essential. Learning music at Kutsinhira also exposures kids to the history and culture of Zimbabwe and includes classroom visits by guest Zimbabwean teachers. Will I get to play the big marimbas? Absolutely! However, it’s a good idea to clue your teacher in to your desire to play the bass or baritone since there are only one each and usually 8-10 students in a class. What about learning to play mbira? With the blessings and guidance of our Zimbabwean master teacher, Cosmas Magaya, Kutsinhira began offering beginning mbira classes in 2003. Zimbabwean-made mbira are available for rent or purchase by Kutsinhira students. Much of the marimba repertoire is inspired by, or comes directly from, mbira; learning to play this ancient instrument and its traditional repertoire is rewarding for marimba players and non-marimba players alike. Eugene has one of the largest communities of mbira players in the Northwest so there is ample opportunity to play mbira with others both in and outside of class. We start new adult and youth marimba classes in fall term. During the year, it may be possible for eager new students to join an ongoing class. For more information, visit the Classes page.